In his recent book 'These Uncertaine Tymes' Dr Stuart Jennings has shown how plague was rife in Nottinghamshire at the end of the Civil War. The image below is an extract from the parish register of burials for East Stoke near Newark from 1646 where deaths from plague are marked by a cross. These plague deaths are associated with Newark, but are recorded in the parish register for the neighbouring parish of East Stoke. The reason for this is that the deaths probably occured amongst those working to pull down Newark Castle which was actually situated administratively in the parish of East Stoke. 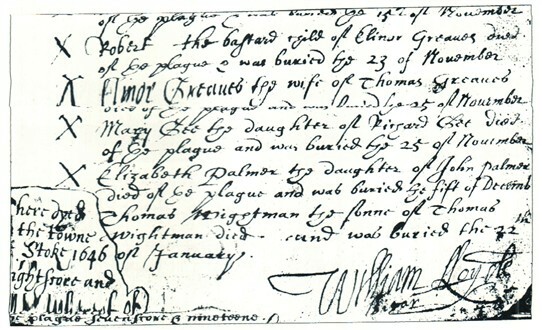 "There died in the towne of Stoke 1646, eight score and one whereof of the plague, seven score and nineteen"
ie total deaths in the parish that year were 161, of which fully 159 were due to plague.